Need Custom Injectors? Left are just a few of many. Call us with your requirements!NitroJection full flow and venting gas pins are designed to optimize the profiled gas pressure control capabilities of the NitroJection gas assist processing systems. Simple installation, low maintenance, and engineered to use the advantageous Auto Purge capability of the NitroJection process controller. Standard configurations and custom lengths and designs to suit your specialized applications. Call us for application support! 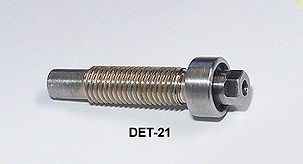 NitroJection’s DET-21 in-mold gas pins are time tested to provide durable and efficient gas flow for injecting nitrogen and venting pressure from the mold. 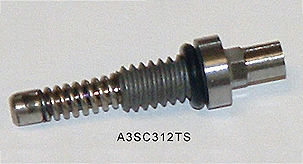 Overall length 1.375″, threads 1/4-28. In-stock and competitively priced. 4140 alloy construction. Available with custom dimensions to fit your gas assist molding program. Also available in stainless steel construction, normally only recommended when molding corrosive resins such as PVC or other flame retardant materials. NitroJection’s A3SC Series enhanced durability and enhanced flow self cleaning gas injector. 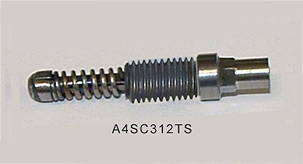 Assembles into tool without removal from the molding machine, with ¼-20 threads. Improved flow path provides increased gas flow over any other injector available in the industry, plus self-cleaning function. Stainless steel construction is available but only recommended when molding corrosive resins such as PVC or other flame retardant materials. 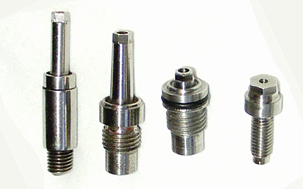 This product is a direct remove and replace for older gas injectors with a 3/8″ diameter “shoulder” and 1/4-20 threads. 5 spare O-rings. NitroJection’s A4SC Series Enhanced durability and enhanced flow self cleaning gas injector. This is the same basic design and function as the A3SC Series, but with a .281″ diameter shoulder for assembly in hard-to-fit locations in the mold. NitroJection’s A5SC Series gas pin is the same design and function as the A3SC Series, with an added titanium nitrite coating for even superior durability when molding with reinforced resins. NitroJection’s A6SC Series gas injector is the same as the A5SC Series, except it has a .281″ diameter shoulder for assembly when less space is available in the mold. 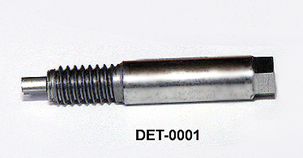 NitroJection’s DET-0001 is a replacement for gas injectors in existing molds. Low cost, durable and efficient, but not recommended for new applications. 8-32 threads. 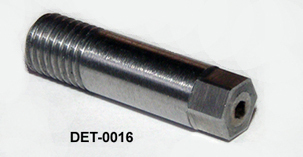 NitroJection’s DET-0016 is a replacement for gas injectors in existing molds. Low cost, durable and efficient, but not recommended for new applications. 1/4-28 threads. NitroJection’s DET-AGA1 is designed to replace gas pins that were used long before current designs with self cleaning features and high flow capability were developed. We do not recommend these for new applications, but they are the best units available in the industry for replacement in older applications. We can also assist you in converting to later design injectors, which will eliminate having to remove the mold from the molding machine for cleaning or replacement, as this design requires.